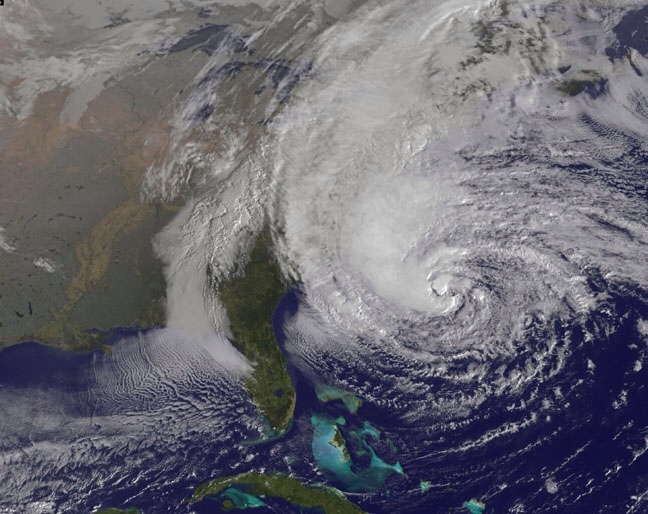 Hurricane Sandy in a satellite photo taken Sunday morning by NASA. Photo credit: NASA. By 10 p.m. Sunday night, mass transit agencies in New York, Philadelphia, Baltimore, and Washington, D.C. had announced that trains and buses would not operate Monday, marking the first time in U.S. history such widespread public transportation service suspensions have been announced before the serious part of a storm has even begun. The pre-emptive shutdowns are being done in order to have time to protect infrastructure from the storm, as well as to encourage area residents to get ready for Sandy, which thus far appears to be a very bad storm. Of course, residents of the area have every right to fight a project they think will harm their neighborhood. But some principles should guide decision-makers and activists as they consider the relative merits of big projects versus neighborhood integrity. Planners should not burden communities with projects of marginal importance but rather focus on those that are essential for the region’s future; they should listen to concerns that their proposals generate; and they should make every effort to minimize harm. With the Expo Line extension, proponents have passed all those tests. The line is crucial to completing a desperately needed rail network, one undeniably integral to the future of L.A., and the route was sensibly chosen along an existing right of way. Extensive hearings did give residents a chance to express themselves — and in fact, many area residents stepped forward in support of the line’s construction. As for the opponents: Sometimes neighborhoods must accept inconveniences that serve a larger good. This is one of those times. And here is our post from last Monday’s news conference by public officials about the court case and possible work stoppage. Expo 2, by the way, is funded mostly by the Measure R sales tax increase approved by nearly 68 percent of Los Angeles County voters in 2008. As those following the project know, the first phase will go to La Cienega instead of Fairfax — a big difference. As a result, the long-range plan goal of 2019 to Fairfax has been replaced with an estimated completion date of 2023 for getting to La Cienega — which originally wasn’t supposed to open until 2026. All this has been previously explained by the subway planning team, but the daily papers in town haven’t been covering it. In the meantime, the subway planning team is continuing its pre-construction planning and utility relocations on the project are expected to begin soon. Editor Damien Newton is back behind the keyboard after a few weeks of paternity leave and he writes that the next week on L.A. Streetsblog will be largely devoted to J coverage. In the time being, the L.A. Streetsblog Board — as is often the case — declined to take a position on J. Damien also has a few entertaining graphs on a recent dispute between the BHUSD Board and student journalists at Beverly Hills High. Residents of downtown Los Angeles near the proposed streetcar route have a vote-by-mail election in late November to decide whether to tax themselves to help fund the project. The ballot will ask residents to pay up to $85 million, a number higher than the $62.5 million frequently discussed by streetcar proponents. That higher figure has rankled some downtown property owners while streetcar officials say the higher amount is being used to protect the project from any funding shortfalls or cost over-runs. Los Angeles Streetcar Inc. still says that the average condo owner will pay about $60 in yearly streetcar taxes, with amounts varying depending on how close residents live to the tracks. Great to see AEG contributing to the cost to upgrade the station. Why isn’t Comcast NBC Universal not contributing for the cost to build the $20M pedestrian bridge from the station to Universal Studios/City? We need more companies to help out in construction of train stations. Some of them are getting old and is need of a major face lift. I think Metro needs to seriously look into reaching out to corporations to help build the cost of stations in exchange for retail space. 7-Eleven chips in a million to the construction of a particular rail station and in exchange they get to open up shop at that train station. Bank of America chips in $50 million, they get to install BofA ATM machines or even open BofA mini-branches at 50 stations. Something like that would help a lot in reducing tax payer dependency in building everything out of tax funds. Warren, we should actually pin Universal to fund a tunnel for street crossing. Much better than an ugly bridge. So metro is still selling the mythical $60 per year for the Average condo owner? Do you guys do math? LASI even changed their website recently to reflect the 85 million but they are still saying the median condo owner with 1000 square feet is $60 per year. Just look up the rates. zone 1 is $.59670 per square foot. Not $60 but $600. To some people that still may not be a lot of money but over 40 years it turns out to be quite a chunk of money. Everyone has been passing this off as a small price to pay for residents with great benefits, but if they need to fake the math to sell it what else are they hiding? Broken record I may be, but the truth will set you free! I can understand the concerns that the neighborhoods along the next phase of the Expo Line feel about the construction of the light rail. But, what if the existing right of way had never not stop being used and the old freight trains that used to run down Exposition still ran? Residents of our fair city seem to forget when trains ran all over the area hence the reason some of our streets are so wide (Venice in particular – that median used to house train tracks!). In order to combat the grid lock of having 5 million plus people in the city, the trains can offer some relief and get people out of their cars.